Transitioned peacefully in his home on March 28, 2019. A loving father and lifelong Washingtonian. He is survived by one sister, seven children and 12 grandchrldren. His hone going ceremony took place on March 30, 2019. 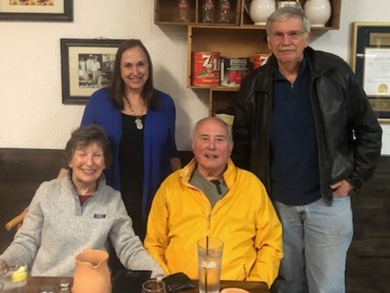 As part of a Florida vacation to visit family and friends, Jim Roddy and his wife, Bryce (seated) also visited fellow CHC member Mike Saffell and his wife, Ingrid, in Naples, FL. Traveling north, Jim and Bryce stopped at North Myrtle Beach, SC to visit CHC member John Smithson and his wife, Debbie (standing). Both visits were great fun with a mixture of reminiscing old times and the challenges of today. (Unfortunately, no photo was taken at the Saffell visit.) Thanks for sharing, Jim. Standing: Brain Bowman, Frank Davis, Joe Gerber (seated), Charles Brown, Melvin Lowry, Don Zugby (seated), Fr. John Mudd, Rick Warner, Bill Finnin, And Bob Peterson. The Classmates Helping Classmates group (CHC) held its Winter meeting on December 12, 2018 with 10 members attending, including Fr. John Mudd. The agenda was short addressing some administrative issues, updates on a few classmates, and “Do You Know?” questions about our days at Carroll. . Click on the CHC link on the left for further details. In this holiday season, we wish all of our classmates good health and safe travels.